Most gut-health experts will tell you that in order to heal your gut you need a ton of both probiotic foods and prebiotic foods. But what exactly are probiotic foods vs prebiotic foods? Not all probiotic foods are created equal. Example: Activia yogurt is not the same as raw, purely unprocessed, yogurt. The same goes for the rest of the dairy products I mentioned. Miso is fermented soy. It makes an awesome soup. Sauerkraut, pickles, and kimchi are fermented vegetables. Fermented vegetables have probiotic value. Kombucha is a fermented tea. Learn how to make Kombucha at home. But if you suffer from Candida (or active SIBO), consider holding off. 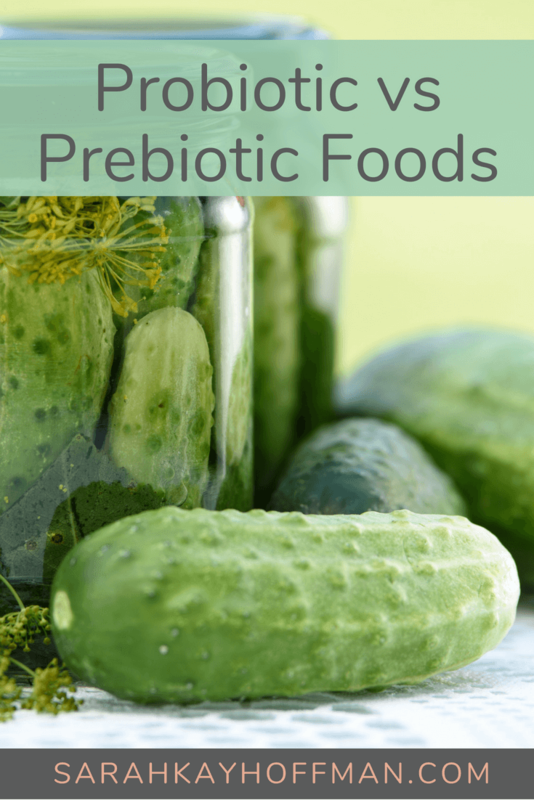 Simply put, prebiotics are the fiber foods which feed bacteria. When your digestive system isn’t working as it should, your gut will likely hurt just looking at those foods in bulk. 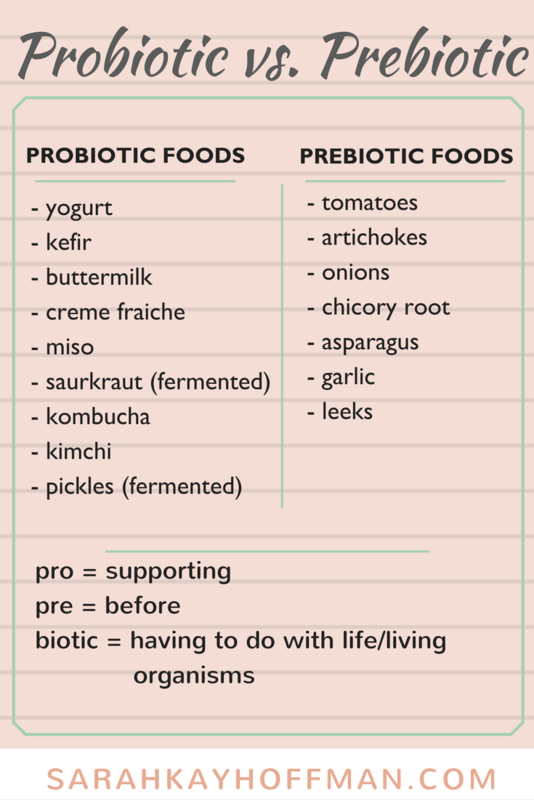 If you’re at the place in your life when you are truly ready, willing and able to heal your gut, the probiotic foods are much more likely to help you (early on) and the prebiotic foods are much more likely to hurt you (early on). Probiotics are there to help you (re)build the good guys. Don’t expect to keep on keepin’ on with your old ways, throw in some probiotics and be magically healed. It won’t work that way. Make changes first. When you make changes that support real gut healing you will, in essence, begin “starving” the “bad bacteria.” After a short amount of time, the probiotic foods will help to continue crowding out bad bacteria and crowding in gut-thriving bacteria. I’m currently taking Primal Probiotics. But the prebiotics? They are full of fiber (I’ve already talked about fiber). They help feed your bacteria. And the problem with this is that YOU, miss Gutsy friend, have a gut filled with bacteria that, last time I checked, you probably don’t want to be feeding. Yes? I speak from experience and from a life devoted to this for several years. I don’t speak from theory derived out of a textbook. It’s really easy to do a Google search on “Prebiotics for Gut Health,” but 99% of the return results most likely are making you feel even more miserable. But the goal? The goal is to arrive at a place where you are eating all the probiotics and prebiotics because our guts thrive with the combination. Interested in more on gut health and healing? 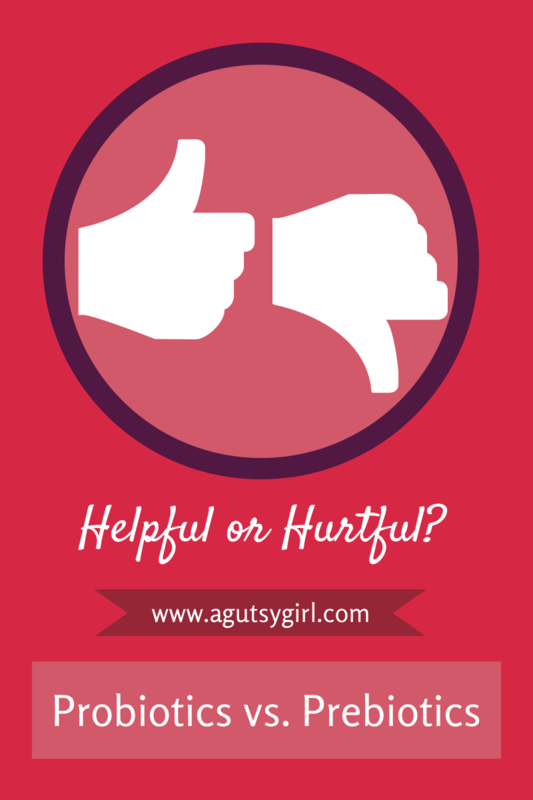 Grab The Gutsy Girl’s Bible: an approach to healing the gut, 3.0. As always, if you’re ready to heal, I’m ready to help! Ohh, this was such a helpful post! I’ve been trying to figure out if I needed to prebiotics in my diet, but maybe that’s why my gut goes crazy when I eat lots of tomatoes. Makes total sense now. Unfortunately, I seem to be the one in a million who have a horrible reaction to fermented products. I get this really weird rash from them. So random. I’m actually not too sure if I do! It’s possible though…now I’m curious ha. That’s a great idea Sarah! I will definitely will be doing that! oh prebiotics. They ruined me once! But i can finally have a little here or there no problem! But i’d rather load up on probiotics… KOMBUCHA! I react terribly to all probiotics and am positive that I have SIBO so I’m confused where to start if your gut cannot heal with bad bacteria present. 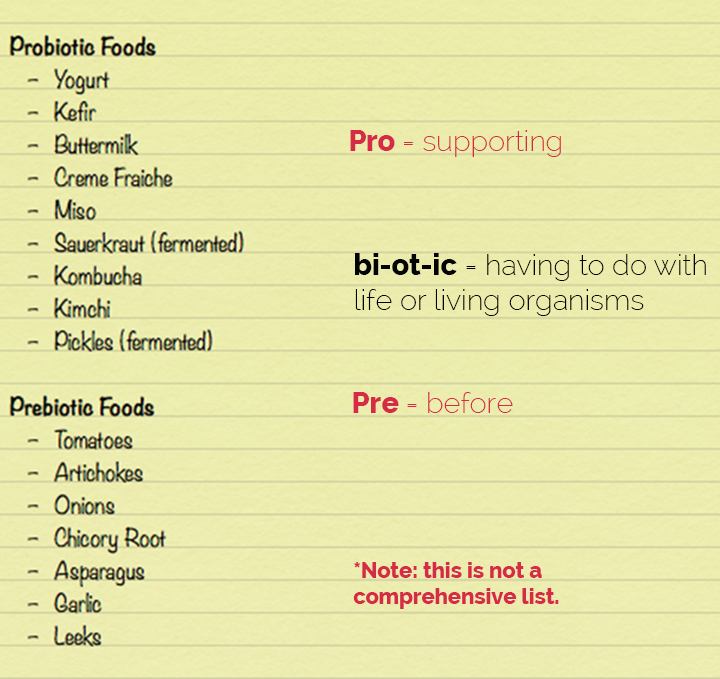 Without knowing anything about you or your situation, I would say to focus on the food vs. adding a probiotic. SIBO is pretty specific, so you’ll have to be really focused and diligent in your healing.